As most kids do mine have a penchant for animals. Alive OR dead. It started as an obsession with bugs which I now realize was the gateway drug to a much bigger problem. At one point I had no less than 7 Mason jars arranged across my kitchen counter housing different species of bugs. Like any good mom we researched (ie googled) how to care for each individual species. Turns out I have a knack for ladybugs and was able to keep a hoard of them alive for about 3 months. Sadly for every other living thing that enters my house it’s just a matter of time. As I looked at her tear stained face I realized what I must do. I remembered back to a science class when I was in high school. We had been on a nature hike and had found a dead rodent of some sort. My biology teacher, being the eccentric character that he was, immediately bagged it up, brought it back to the classroom, and proceeded to dump it in a crockpot for 3 days boiling off the skin and leaving nothing but the skeleton. We were then able to study a perfectly preserved bone structure. Much to my husband’s dismay I went out into the yard and moved the decaying turtle to an “inconspicuous” place so that nature and the ants could have a go at it. After about 6 weeks the smell of rotting turtle at my front door became too much and I went to Walmart and purchased a cheap pot to boil it in. Obviously this pot would never be used again. We cranked up the flame and set the pot on top. Within minutes it started boiling and the stench that arose from the pot was palpable. I guess I should add that I live in a nice community, a golf course community at that. My neighbors, although already aware that I am a “bit different”, were none too happy with the wafting smoke and scent of boiling 8 week old turtle. In fact the smell became so overbearing that we had to retreat inside to shield ourselves. After about 10-15 minutes of boiling I asked the hubs to check on our science project. He opened the garage door and stumbled backwards a few steps from the smoke and smell billowing into the kitchen. He grabbed a potholder and ran to the pot to remove the lid only to find that all the water had boiled out and there was nothing but black ash in the bottom of the pot. No bones, no shell, no remnants of anything remotely resembling a turtle. We had, in effect, cremated the turtle. The only thing worse than the smell was the sound of Eeny’s screams when she realized that there was nothing left of her beloved “pet”. “IT’S GOOOOOOOONE” she cried. As we dry heaved into the bushes. After we were able to stop gagging we scattered the ashes in the woods, dried her tears, and threw the pot away. 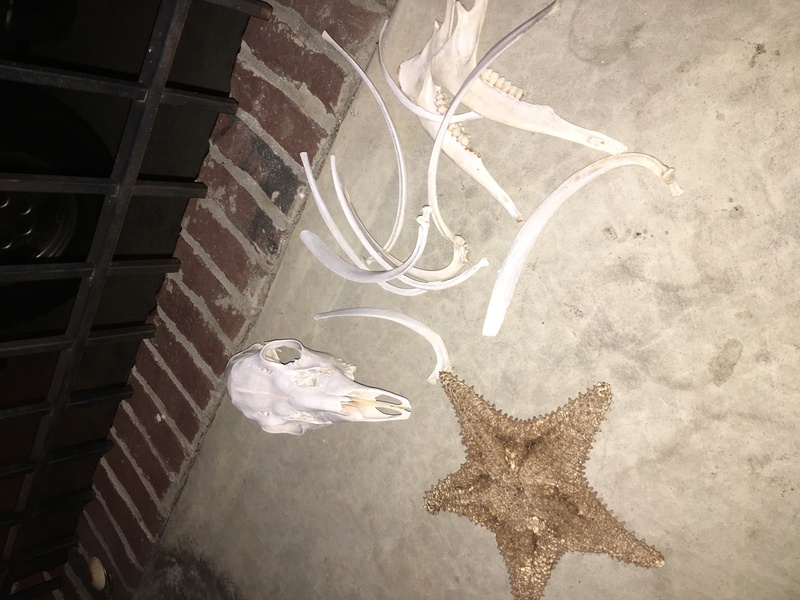 So if you ever happen to come over, don’t be put off by the deer skeleton, the smelly conch shells, or the starfish drying on my front porch. Yes it smells a little funny but just know it’s all in the name of science- well that and a little touch of crazy love for my kids. Also, rest east knowing I will never become a homeschooling mom. If you like this post you’ll probably also like Why I’m throwing out the last thing my grandmother gave me or Meet the teacher AKA The Night From Hell.